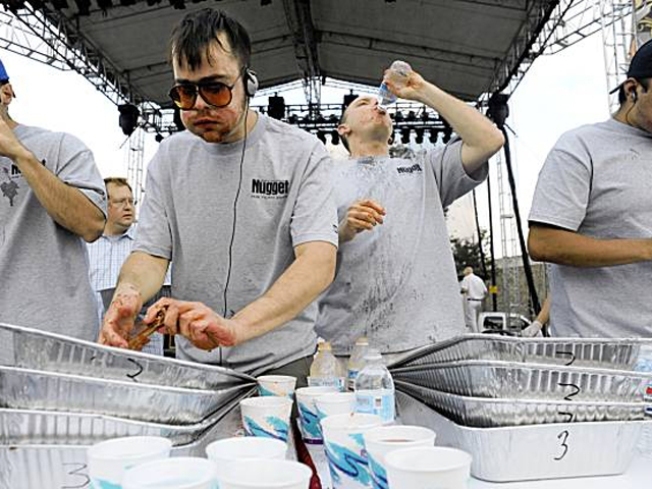 Pat Bertoletti, left, leaves Joey Chestnut far behind. A Bay Area legend has fallen. The reign of the pride of San Jose as the King of Ribs is over. Joey Chestnut, the top-ranked competitive eater and three-time defending champion, has handed his crown as the winner of the Best in the West Nugget World Rib Eating Championship in Sparks, Nev. His reign lasted three years. Pat "Deep Dish" Bertoletti of Chicago beat the famed Kobayashi slayer on Wednesday by one-tenth of a pound. Bertoletti downed 5.8 pounds in 12 minutes. Most of the crowd was cheering for Chestnut and a few groans came from the group when Bertoletti was announced winner. Wednesday's contest was the fourth annual and featured 12 competitors. Chestnut, of San Jose, Calif., is ranked No. 1 in the International Federation of Competitive Eating. Bertoletti is rated second. Bertoletti said he prepared for the contest by not eating since a large meal on Tuesday. He won $2,500 and his name will adorn a trophy featuring three golden pigs.